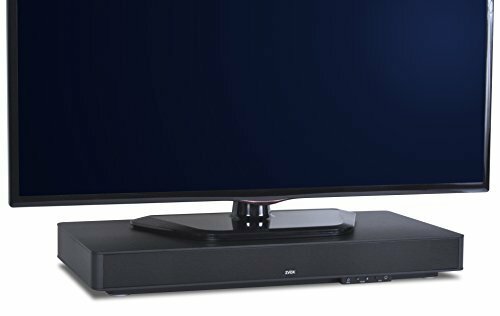 Only 3.5" high, the ZVOX Sound Base 570 home theater system can be placed beneath your flat-panel TV so you can have surround sound without adding a lot of clutter to your room. It requires no external speakers, subwoofer or speaker wires. The 570 reproduces TV shows, music and movie soundtracks with lifelike accuracy, including crystal-clear vocals and thunderous bass. And the ZVOX Phase Cue virtual surround system delivers remarkable three-dimensional sound. With aptX Bluetooth connectivity, you can stream music from your phone or tablet wirelessly. The entire sound bar system, including five full-range speakers, amplifier, virtual surround technology and powered subwoofer, fits into a single slim cabinet. With only one connecting cord and a one-page owner's manual, it is truly "plug and play." The cabinet is robustly constructed using fully-braced MDF (medium density fiberboard), not molded plastic. The 570 includes the ZVOX Accu Voice feature, which uses hearing aid technology to create super-clear voice reproduction - no more turning up the sound to understand what's being said! And the Output Leveling feature automatically turns down loud commercials. You can also program the ZVOX system so that it works with your current remote control. A large, easy-to-read display is hidden under the front grille, and disappears when you're not using it. The Sound Base 570 is an ideal home theater system for people who want great sound, great style and innovative features - without the clutter and complexity of conventional surround sound systems. AccuVoice feature uses hearing aid technology for super-clear dialog reproduction. Built-in subwoofer for excellent bass on music and movies. Fits under your TV or on furniture below - simple one-wire hookup. One page manual. If you have any questions about this product by ZVOX, contact us by completing and submitting the form below. If you are looking for a specif part number, please include it with your message.